We all know how important the design aspects of a weddings are. You want to have linens that wow and lighting that transforms your space. But what about the very first thing your guests see? No, we don’t mean the ceremony décor… We’re talking invitations, and how they set the mood and tone for your whole wedding! The invitation you choose will tell your guests just what your wedding is all about. This is your chance to show guests how formal the wedding will be, what your wedding colors are, your personal style, and of course, the event details. Modern brides are having more and more fun with their wedding invitations! They are breaking the chain of formality and flowers by making bolder and fun choices. Here are some cute invitations to fit our theme! This fun yet subtle peacock invite is literal and whimsical all at once. 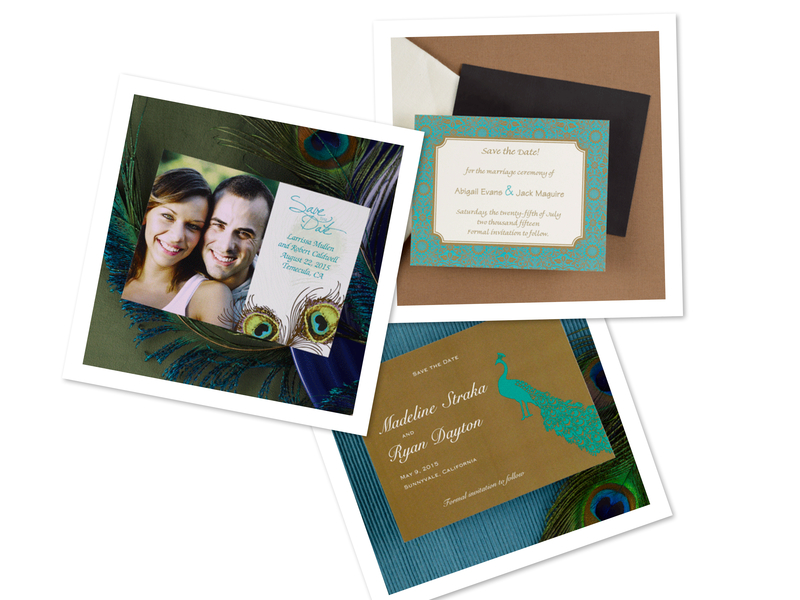 Each card is unique with turquoise peacock silhouettes and feathers accented with bronze. This cute invitation is tea-length and comes in different color combinations! A great invitation for a simple and chic peacock themed wedding. If you’re looking for a less literal interpretation, try something like this invitation, above. The swirls and paisley design resemble a peacock and the colors are fitting as well. This is a bright white, tea-length invitation that is sure to inspire your guests! But before you go jumping to conclusions… Of course we didn’t forget about save-the-dates! These are a great little way to send a heads up about your big day, especially when you’re expecting a lot of out of town guests. Which one is your favorite? This January we are focusing on the very popular peacock themed wedding! With all the different color palettes and inspirations how could we not dedicate a whole month to it!? No two peacock themed weddings look the same. The rich colors and jeweled tones look amazing with the white backdrop of winter. Flowers pop in bouquets embellished with peacock feathers. 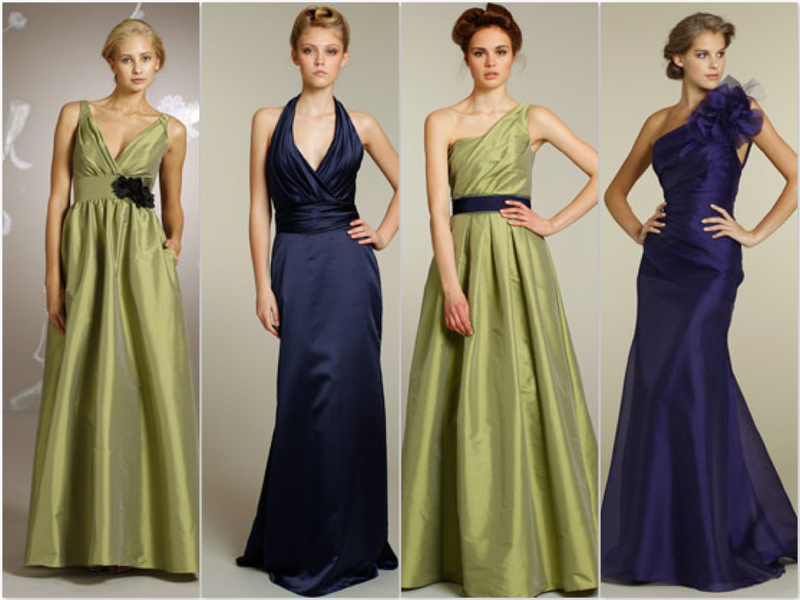 The different combinations for bridesmaid’s dresses are unlimited. Follow our blog all month long for more peacock inspired posts! Think you’ve got what it takes to design a peacock inspired tablescape? Make sure you enter our peacock table linen contest! Just visit our new linen tool on the Trends to Tradition’s website and start creating! Submit your designs to us and yours could be selected as our favorite! When you’re done playing with all the different linens select “email” and send it to traditions@zoominternet.net. We will be choosing the winner at the end of the month and announcing them on our Facebook page. Make sure to “like” us while you’re there!